The simple green bean. 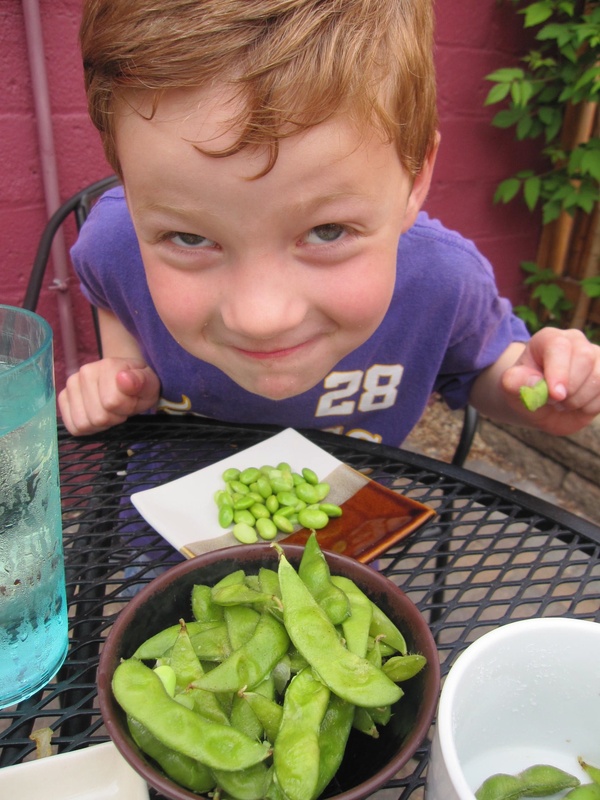 The simple act of a child eating a green bean. The simple satisfaction of that child’s parent. ..well, it’s not quite that easy. And those (at right) are not green beans, rather Edamame. And that (also at right) is my son, making me one of 1 million moms blogging. In totality they are the inspiration for this blog: Edamomie. I’ve got some thoughts on vegetables and kids and seeing as how these topics and a few others I want to delve into neatly fall into the categories of vowels – A E I O U (and sometimes Y for YOLO (Travel Adventures) just added in April 2015), that’s the focus I’m going with. So sharing is going on here, in hopes of shaping my views and learning from others. Perhaps it will make me a better parent. My parents taught me to show up for stuff. This is hard work. I also rock picked, rouged sunflowers and walked beans. If I can find some urban farms, I will get my kids into these lines of summer employment early. For the time being, we’ll do yoga and extremely long bike rides to test endurance for both parent and child. My Dad’s sense of enjoyment for any activity, oddly enough, is directly proportionate to the amount of work put into the activity – the more difficult and challenging it is, the better he feels about it. Fascinating stuff. My Mom’s silent treatment when dealing with my adamant objections to band practice or church nearly drove me insane. Even more fascinating stuff. Try new foods once, repeat 10 times. Introduce with other foods they like or even sort of like. We all know this, yes. But how is it really done? Time to also explore how kids helping with meal planning, shopping and prep effect the actual experience at the family table. The power of saying no to children. Do it often and comfortably. It’s painful to be called names like meanie, but trust me, they will be better people for it in the long-run. I suppose my tendency toward no-ness has translated into my parenting philosophy. No. Did I just say No? I will say it again, No. This category includes the quotables, the stuff you just can’t make up. I have never been one to bring my kids somewhere and sit on the sidelines. There better be some enjoyment in it for me. This might sound selfish, but there’s a genuine energy and enthusiasm kids can pick up on if you’re just going through the motions. I think of outings as collaborative adventures, where my kids teach me something too. I like things of three, so for this category going for art/culture and eats combos. Adaptable, flexible and free-thinking. The more comfortable they are in trying new things or exploring in unknown situations, the more well-rounded kids they’ll become. Your life will be easier too. With any luck, they can become quite the adventurers, information gatherers and conversationalists. Here we try new stuff – recipes, crafts, visits to new locations. The impression that new destinations, journeys and experiences can have on a young mind are ever-lasting, life altering and important. We make time for travel and exploration at least taking one larger annual trip. These posts include our destinations from Northern MN to Glacier National Park to the Smoky Mountains.